Are you playing along with Mo this week? If so, sign Mr Linky! Oh that is sooooooooooo neat. The last run through the local mall had me gazing at cell phone upgrade. MUST HAVE GRAPHIC capability. Have fun. you are so lucky!! Have a great monday!! i have that exact phone! i got it last may for mother's day and i love it! hope you do too! Great looking phone and so many features! I just offered myself a new one, but a Nokia. I am very happy with it. Just wanted two functions : telephone and take pictures nothing else but of course there is a lot of to me useless stuff in it. Yours looks beautiful ! It's much smaller then mine ! Ooo, I'm jealous! Love the pink. 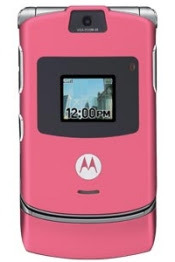 Oooo...I wanted a Razr phone too-and pink. The litle girl is cute....WHAT? I really want the Red Razr, but my cell carrier is not getting them, and I don't have Sprint. Sigh. Hubby loves his Razr; I'm sure you will too! Aren't camera phones great? Have you figured out the video on your phone yet? 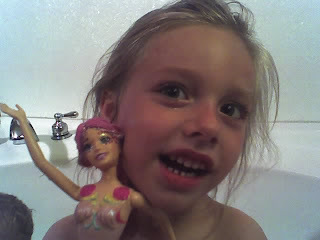 My daughter has that same mermaid...lol. 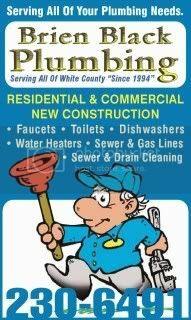 Great picture! Your daughter sure is a cutie and your new phone takes great photos. I LOVE my Razr ---Such a cool phone!! The more you use it the more you'll appreciate it. I have the brushed stainless--I am a silver girl. I love that phone because it's pink! I looked at that one, but I was afraid I would keep dropping it because it is so slim. I'm not sure that's a "plus" feature for me!